Moore was founded during the land-run of 1889. The early settlers came on train, horseback, wagons, and some, on foot. According to local historians, the town's original name was "Verbeck" as designated by the railroad company. However, a railroad employee named Al Moore, reported to be either a conductor or a brakeman, lived in a boxcar at the camp and had difficulty receiving his mail. He painted his name - "Moore" - on a board and nailed it on the boxcar. When a postmaster was appointed, he continued to call the settlement Moore. When the town incorporated in 1893 the name was legalized. The original town site comprised a small area bounded by the present NE 3rd Street on the north and SE 4th Street on the south; the eastern limit was situated about one and a half blocks east of the railroad and the western edge about two and a half blocks west of the railroad. The little town slumbered comfortably for seventy years -- then it exploded in a frenzy of expansion and development that attracted attention nationwide. 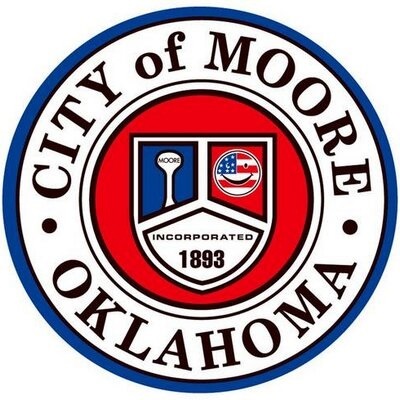 In 1961 approximately 21.6 square miles of additional territory was annexed and Moore became a city in 1962. The decade of the 60’s saw Moore’s population soar. The 1970 census showed an increase of more than 950% for a total of 18,761. The 1980 Census recorded 35,063 residents - an 86% growth rate. Moore continued to grow during the 80's, with the 1990 Census indicating a 15% increase to 40,318. The 2010 population for Moore is 55,081. An important factor in the city's growth has been its location. The close proximity and easy access to the state’s Capitol city on the north and the University of Oklahoma to the south make Moore an attractive, convenient place to live. On May 3, 1999, Moore experienced the most violent tornado ever recorded. As a result, over 1,000 dwelling units were destroyed and some 3,000 to 4,000 residents were either temporarily or permanently displaced. Several hundred homes have been rebuilt, and Moore was almost 100% recovered from that devastating storm when the massive, grinding, May 20, 2013 tornado devastated the community once again. However, with assistance from across the Nation, the community is quickly recovering and rebuilding because its citizens are "Moore Strong!" Copyright© 2019 MLSOK, Inc. This information is believed to be accurate but is not guaranteed. Subject to verification by all parties. The listing information being provided is for consumers’ personal, non-commercial use and may not be used for any purpose other than to identify prospective properties consumers may be interested in purchasing. This data is copyrighted and may not be transmitted, retransmitted, copied, framed, repurposed, or altered in any way for any other site, individual and/or purpose without the express written permission of MLSOK, Inc. Information last updated on Apr 23, 2019 8:33:am.